LYON, France -- The wife of Interpol's president made an impassioned plea Sunday for help in bringing her missing husband to safety, saying she thinks he sent an image of a knife before he disappeared in China as a way to warn her he was in danger. 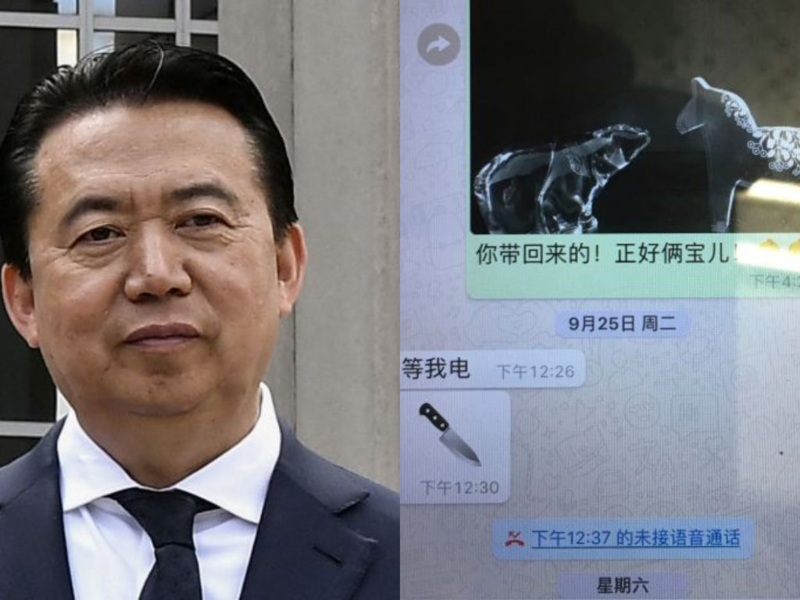 Grace Meng detailed the last messages she exchanged with her husband, Interpol President Meng Hongwei, to reporters as part of her unusual appeal. Meng is China's vice minister for public security, and regularly traveled between Beijing and Lyon, France, where Interpol is based. His wife's plea underscored how China's system of shady and often-arbitrary detentions can ensnare even a senior public security official with international standing, leaving loved ones uninformed and in a panic. Chinese authorities said Monday they're investigating Meng for bribery and other crimes and indicated political transgressions may also have landed him in trouble. In a statement posted on a government website Monday, the authorities said Meng Hongwei, China's vice minister for public security, was being investigated due to his own "willfulness and for bringing trouble upon himself." China had announced less than an hour after Grace Meng spoke Sunday that Meng was under investigation on suspicion of unspecified legal violations. That made him the latest high-ranking official to fall victim to a sweeping crackdown by the ruling Communist Party. Interpol then announced that Meng had resigned as president, effective immediately. It did not say why, or provide details about Meng's whereabouts or condition. He was elected to lead the international police agency in 2016 and his term was not set to end until 2020. Meng's unexplained disappearance in China, which had prompted the French government and Interpol to make their concerns known publicly, threatened to tarnish Beijing's image as a rising Asian power. Beijing's one-sentence announcement about Meng being the focus of an investigation, issued when it was nearly midnight in China, said only that Meng was in the custody of party investigators. The disciplinary organ of China's ruling Communist Party said in a brief statement on its website that Meng was "suspected of violating the law and is currently under the monitoring and investigation" of China's new anti-corruption body, the National Supervision Commission. "This is political ruin and fall!" she wrote in a text message to the AP. "I can't believe because the rule of law (in) China is his lifelong pursuit." "From now on, I have gone from sorrow and fear to the pursuit of truth, justice and responsibility toward history," she said, her voice trembling with emotion. "For the husband whom I deeply love, for my young children, for the people of my motherland, for all the wives and children, so that their husbands and fathers will no longer disappear." The appeal by Meng's wife for justice and fairness echoed pleas from the families of scores of people who fell afoul of the Chinese Communist Party under President Xi Jinping's rule. Some of them might even have been pursued by Chinese authorities under Meng's watch. Such targets, who have been subject to arbitrary detention and made unexplained disappearances, include pro-democracy activists, human rights lawyers, officials accused of graft or political disloyalty and the estimated one million ethnic minority Muslims who have vanished into internment camps in the country's far west. In a sign of her nervous apprehension, Meng's wife would not allow reporters to show her face, saying she feared for her own safety and the safety of her children. She was accompanied to the hotel where she held her press conference by two French police officers who were assigned to look after her. Grace Meng said she hadn't heard from her husband since Sept. 25. Using his Interpol mobile phone, he sent her the emoji image of a kitchen knife that day, four minutes after he sent a message saying, "Wait for my call." Of the knife image, she said: "I think he means he is in danger." She said he was in China when he sent the image. Before he shared the knife image, she sent him a photo of two animal figurines, one of a bear and another of a horse, meant to represent their two children; one of them loves horses, she said, and the other "looks like the bear." Xi, China's most powerful leader since Mao Zedong, has overseen a harsh crackdown on civil society that is aimed at squelching dissent and activism among lawyers and rights advocates. Meng is China's vice minister of public security as well as president of the International Criminal Police Organization, best known as Interpol. The agency said Saturday it has used law enforcement channels to inquire with China about Meng's status, citing concerns for his safety. Meng's various jobs put him in close contact with Chinese leaders in the security establishment, a sector long synonymous with corruption, opacity and human rights abuses. Meng, a member of the Communist Party, worked with former security chief and Politburo Standing Committee member Zhou Yongkang, who is now serving a life sentence for corruption. However, Meng's wife sought to distance her husband from Zhou, saying the two men did not get on. She said Zhou had sought to muscle her husband out of the public security ministry -- the national police force -- several times and disliked her husband "very much," She did not explain what, if any, relation that animosity may now have with her husband's case. Zhou was one of the highest-profile figures caught up in President Xi Jinping's sprawling campaign against graft at all levels of government, military and state industry. Officials under suspicion often disappear into the party's investigatory body, which can hold them for months without releasing information or providing them with legal counsel.